You want to learn about Hand Casting? You've come to the right place. Alginate for dentistry was invented about 80 years ago. Hand casting with alginate was probably invented about a week later. Not only is it safe, inexpensive, fun and educational- the hand casting can be something that is treasured for years. You can purchase one of our Casting Kits if you are just starting out- or you can purchase the bulk materials and save a little money. We sell kits for Babies, Children, Adults and Families. When the LiquiStone hardens, peel the alginate off your finished hand casting. 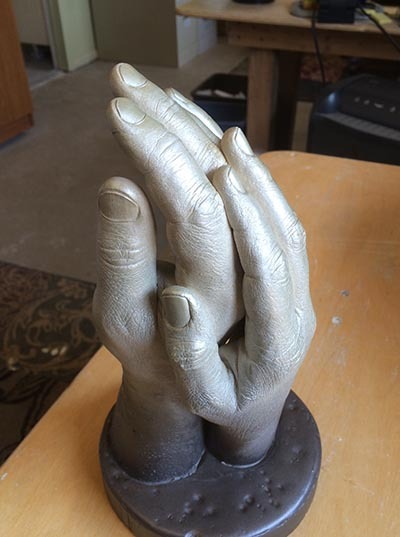 One or more hands can be cast in a single sculpture. We've done as many as 15 hands in a single hand casting. Once you're done, the hand casting can be painted or finished in a myriad of different ways. Just imagine having a hand casting of your newborn baby or of your grandparents. These heirlooms are often set in places of honor in the house. On this website there is lots of information about alginate, as well as procedural guides and videos.